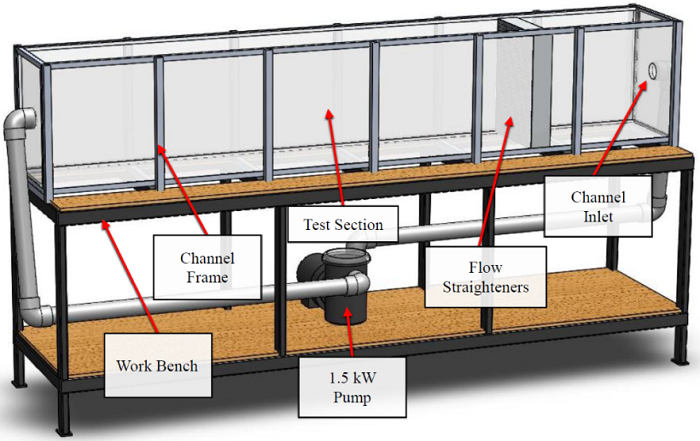 A water channel for performing flow visualization and studying scale models in fluid mechanics was designed, analyzed, and manufactured with commercially available components. The material cost of the channel is 10% of the leading educational units, and the manufacturing processes required for channel construction are basic and typical of local craftsmen in developing countries. Both structural analysis and flow rate calculations were performed to verify the functionality of the tunnel. Hand calculations and Finite Element Analysis were used to model stress and deflection in the channel floor under hydrostatic loads. These were used to select a polycarbonate panel thickness that will withstand the hydrostatic and hydrodynamic loads on the channel floor and walls for a projected useful lifespan of 40 years. The water channel has a test section area that is 30 cm by 42 cm and up to 1 m long. The system pump is capable of generating incident flows of up to 7.1 cm/sec in the test section. The channel is also designed to be upgraded with a tow carriage, allowing for flow visualization as well as fully submerged and partially submerged models with Reynold’s or Froude’s number dependent studies. R. I. Emori and D. J. Schuring, Scale models in engineering: fundamentals and applications, Great Britain: A. Wheaton & Co. Ltd., 1977. W. C. Young and R. G. Budynas, Flat plates, 7th ed. New York: McGraw Hill, 2002. J. Jansen, “Understanding creep failure of plastics,” Plastics Engineering, Society of Plastics Engineers, 2015. P. J. Gramann, J. Cruz, and J. A. Jansen, “Lifetime prediction of plastic parts,” Proc. in Annual Technical Conference, 2012, pp. 1313-1318. B. R. Munson, D. F. Young, and T. H. Okiishi, “Fundamentals of Fluid Mechanics- dimensional analysis of pipe flow,” 6th ed. New Jersey: John Wiley & Sons, inc., 2002. WHISPERFLO High Performance Pump, “Whisperflo curves,” http://www.pentairpool.com/products/index.html. J. Rutledge and J. J. French, “Design and Analysis of a Water Channel for Characterization of Low Reynolds Number Flows”, AITI, vol. 3, no. 3, pp. 101-108, Mar. 2018.